The global financial crisis that reached its peak in late 2008 has brought the importance of financial services regulation and supervision into the spotlight. 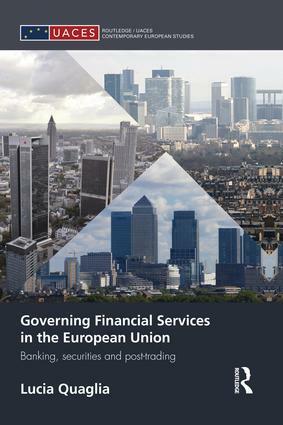 This book examines the governance of financial services in the EU, asking who governs financial services in the EU, how and why, and explaining where the power lies in the policy-making process. It covers the main financial services: banking, securities, payments systems, clearing and settlement. Addressing the politics and public policy aspects of financial market integration, regulation and supervision in the European Union, this book conducts a theoretically-informed and empirically-grounded analysis of financial services governance from the establishment of Economic and Monetary Union (1999) and the launch of the Financial Services Action Plan (1999), to date. It also assesses the EU responses to the global financial crisis. Providing a reliable and unique insight into the politics of financial services regulation in the EU based on an extensive programme of interviews with policy makers and stakeholders across Europe, the book will be of great topical interest to students and scholars of European Union studies, political science and political economy. Lucia Quaglia is Senior Lecturer in Contemporary European Studies at the University of Sussex, UK. She is the author of Central Banking Governance in the European Union: A comparative analysis (also published by Routledge).